Fritz Gammel was born on 6 March 1914 at Bonn. Gammel was serving with JG 53, based in Sicily, in Spring 1942. Feldwebel Gammel was assigned to 3./JG 53. He flew combat missions over Malta in the period from December 1941 to May 1942. In May 1942, I./JG 53 relocated to Schwäbisch Hall in Germany where they re-equipped with brand new Bf 109 F-4 fighters before transferring to the Eastern front to be based at Kursk. 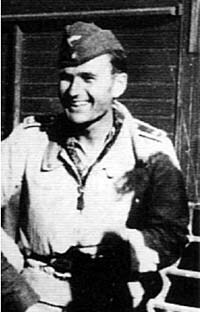 Oberfeldwebel Gammel recorded his first victory on 31 May when he shot down a Russian MiG-3 fighter near Kursk. He was particularly successful during August, claiming 15 victories, including his 10th victory, a Russian LaGG-3 fighter shot down on 9 August. On 4 September 1942, Gammel suffered engine failure in his Bf 109 G-2 (W.Nr. 13 494) “Yellow 8”. He baled out, behind enemy lines, near Seredneje-Pogromnoje, and was seen to land safely to become a prisoner of war. Fritz Gammel was credited with 19 victories. All his victories were recorded over the Eastern front and included seven Il-2 Sturmoviks.